The Outsiders is a film -Rebels in many countries of Latin America and Spain- from the adaptation of the novel The Outsiders by S. E. Hinton, directed by Francis Ford Coppola in 1983. It's a cult film in which Coppola assembled a cast of great actors for be mature and that will be famous throughout the 80's, like Tom Cruise, Matt Dillon, Patrick Swayze, Diane Lane, Emilio Estevez or C. Thomas Howell. 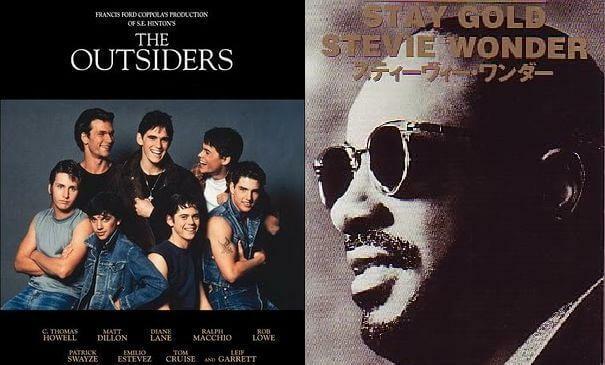 The soundtrack songs goes from Jerry Lee Lewis to Elvis Presley, including the original theme "Stay Gold", composed between Carmine Coppola and Stevie Wonder, and interpreted by Stevie.